When is necessary cut away turned part from bar, you need the Cut operation . 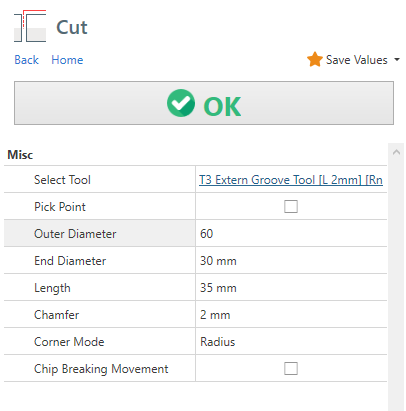 Pick Point : Let you select outer diameter and Length with mouse cursor. End Diameter : It's the end diameter of cut cycle. This diameter is compensated with tool nose radius in gcode. Length: It's the desired length of part. Chamfer : You can create a chamfer or fillet in cut corner. 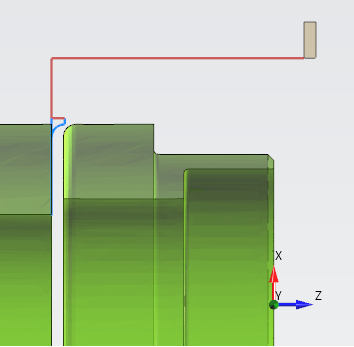 Chip Breaking Movement : When enabled, it create a chip breaking movement instead of a plain work movement to cut the part. This help to create smaller chip.